Too “traumatized after the war,” Marsha Kreuzman didn’t discuss her Holocaust experiences for nearly 30 years. “I cannot actually tell you what date motivated me, but I woke up and said, ‘the world has to know what we went through,’” she recalls. The younger generation had to hear the story. Since then, Marsha’s had an enormous impact. She estimates that she’s shared her story with some 80 young Jews through a Federation program that pairs, or “twins,” survivors with b’nai mitzvah students. Thirteen-year-old Matt Survis was one of her most eager listeners. He learned all about what Marsha, now 91, experienced: her imprisonment in the Plashov labor camp in Poland for four years, where she had only rags to protect her from frigid snowstorms; the “mountains of dead people” she saw when she arrived at Auschwitz; how cold the crematorium door at Mauthausen felt against her cheek; and the indescribable feeling of liberation in May 1945. Feeling a deep responsibility to ensure that his and future generations knew her story, Matt has put Marsha’s mission into action. 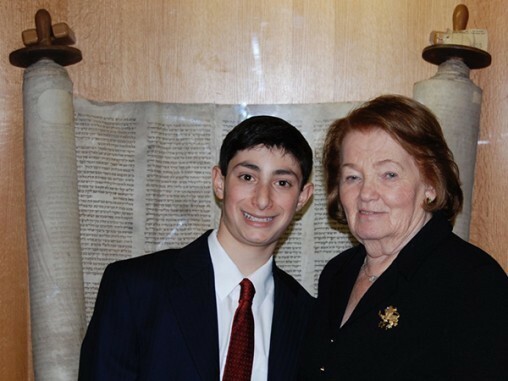 In eighth grade, he developed a curriculum to teach his fellow students about the Holocaust and the stories of Holocaust survivors. At college, he founded the “Upstander Initiative,” a nonprofit that works in schools to humanize the Holocaust through individual stories, discuss the enduring problems of genocide and teach students to recognize prejudice in their own communities. Two other of Marsha’s “twins” and their families have become like adopted family to her, visiting, calling, taking her out for meals—the family she and her late husband, who she met in a displaced persons camp after the war, chose not to have. During his bar mitzvah, one of those twins told the congregation, “I have three grandmothers”—Marsha being the third. Bearing witness to the past sustains Marsha. In addition to the twinning program, Federation helps Marsha share her story with thousands at schools, synagogues and churches and provides her with transportation to and from events. Otherwise, she rarely leaves her home. “I only live for the Holocaust,” she says, wanting “as much as possible and as many children as possible” to hear her life story. And with people like Matt listening, her experience will never be forgotten. Compared to other seniors in the U.S., Holocaust survivors are at a significantly higher risk for poor physical and mental health, depression and social isolation. And as they age, their urgent needs are increasing. A lifeline for tens of thousands of survivors, Federation funds critical medical, housing, nutrition, socialization and transportation services to help this vulnerable population age more comfortably. Learn more.